The Folger’s printed books collection ranges from the mid-1400s—the birth of printing in the West—to the present day. The books cover literary, cultural, political, religious, and social history in Britain and Europe from the 15th though 18th centuries, with a strong emphasis on the 16th and 17th centuries. Without question, the best-known books in the entire collection are 82 copies of the 1623 First Folio of Shakespeare. Some highlights of the collection are shown here, with more information about the scope of our printed books below. The beginning of the Cook's Tale in Caxton's 1477 printing of Chaucer's The Canterbury Tales. 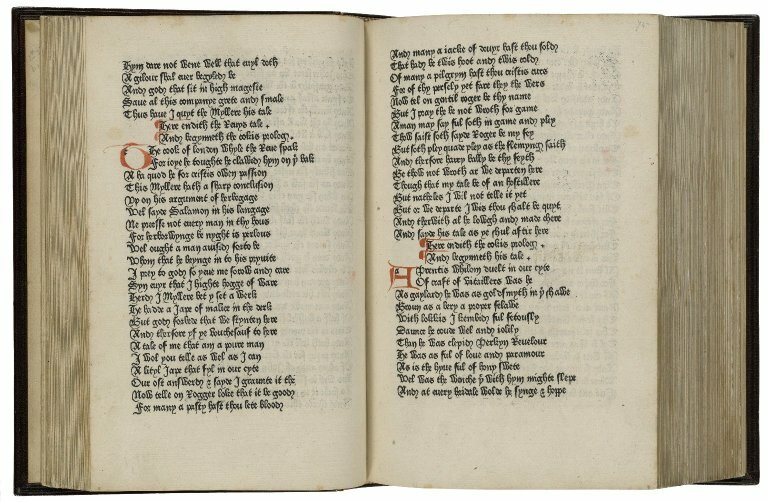 Among the earliest Folger incunables is this 1477 edition of Geoffrey Chaucer's Canterbury Tales. William Caxton produced it in England's first printing shop, located in Westminster at the Sign of the Red Pale. Only ten known copies, including the Folger volume, have survived, in addition to two fragments. Printing was still so new that Caxton and other printers continued to follow the old manuscript tradition of "rubricating"—literally, rendering in red—the large ornamental initial letters, doing so by hand after the body of the text was printed. These pages show the beginning of the "Cook's Tale" and a few examples of rubricated initials. The title page of the first quarto of A Midsummer Night's Dream. [Midsummer night’s dream] A midsommer nights dreame. Shakespeare's comedy A Midsummer Night's Dream was published for the first time as a quarto in 1600. The book's title page, shown here, identifies not only the title and playwright, but the acting company that first performed it and the imprint. The woodcut is not an illustration of the text, but a printer's device, used to identify the book's printer. In this case, the image of a bird, a kingfisher, puns on the name of the printer, Thomas Fisher. To learn more about early quartos of the plays, read Publishing Shakespeare: The Early Quartos. A view of the 78 of the 82 copies of the First Folio, which make up the heart of the Library's Shakespeare collection. 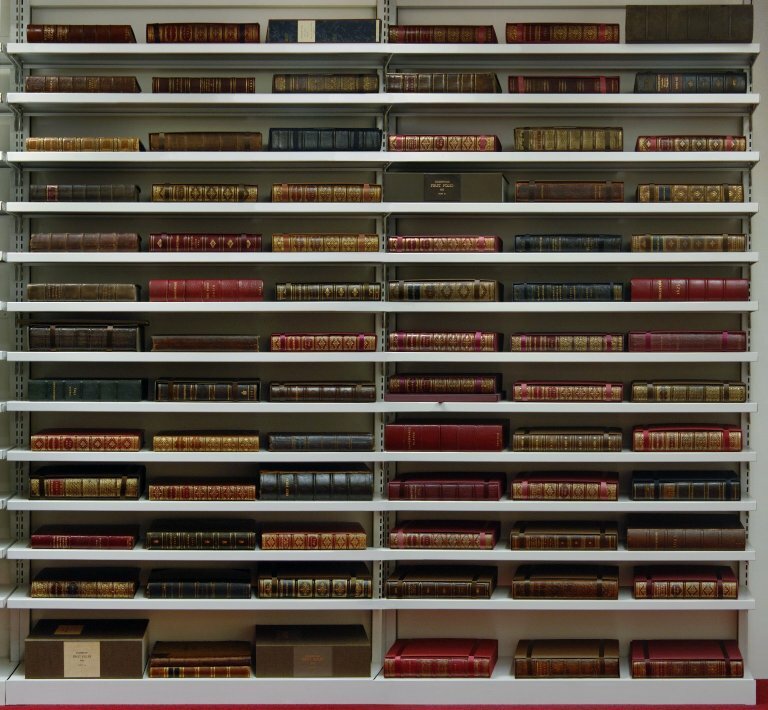 The Folger's 82 copies, all bought by Mr. and Mrs. Folger before the Library opened, represent about one-third of all surviving copies. To learn more about this book, visit Publishing Shakespeare: The First Folio. [Plays] Mr. VVilliam Shakespeares comedies, histories, and tragedies. : Published according to the true originall copies. The first edition of Shakespeare's collected plays was so popular that it was reprinted in 1632 in an edition now known as the Second Folio. The copy of the Second Folio reproduced here is a particularly interesting one. Formerly of the English college in Valladolid, Spain, it bears the certificate of Guillermo Sanchez, a censor for the Holy Office, or Inquisition. As part of their work, the Holy Office routinely blotted out offensive passages from books. The ending of Henry VIII, with its description of the birth of Elizabeth I in terms echoing descriptions of the Virgin Mary, comes in for some particularly heavy marking. The herball or Generall historie of plantes. John Gerard's The herball, or General histories of plantes, published first in London in 1597, was one of the period's most popular herbals, its information made readily accessible with around 2000 woodcut illustrations and English-language text. A second edition in 1633, edited after Gerard's death by Thomas Johnson, helped ensure Gerard's lasting legacy. These pages show the mixture of image and text that is typical of the book. They also show some of the challenges of working with woodcuts—the need to fit the image into the dimensions of the woodblock sometimes meant that images had to be split into parts (the Lady-lace Grasse on the bottom of the left-hand page shows the roots and stem on the left of the illustration, with the upper part of the grass placed adjacent to it) or squished to fit into the space (the Dew-grasse on the left of the right-hand page curves to fit in its fronds). Traicté des chiffres, ou, Secretes manieres d’escrire / par Blaise de Vigenere bourbonnois. Given the need for secure communication amidst religious and political turmoil, Renaissance Europe's interest in cryptography is not surprising. The book shown here, Blaise de Vigenère's 1586 Traicté des chiffres, ou, Secretes manieres d’escrire, is one of the significant collections of cryptographic knowledge from the period. 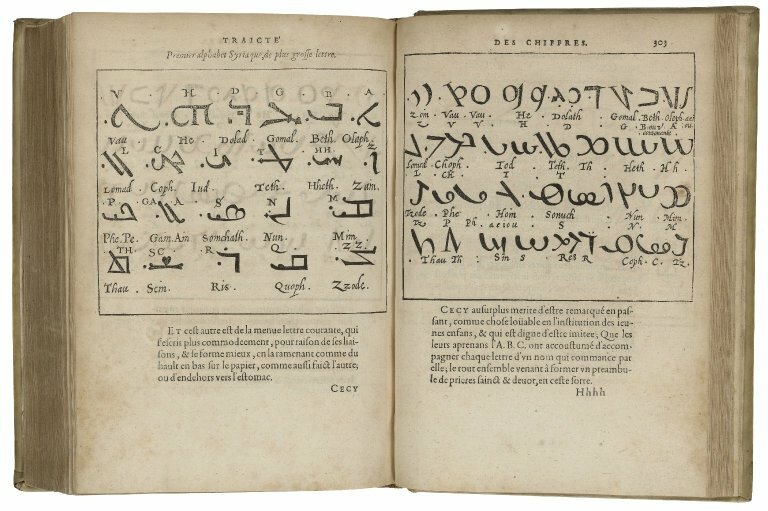 A collection of ancient languages and occult lore, Vigenère's work introduces its users to a variety of methods for secret writing. The opening shown here is of his description and illustration of the Syriac language, which can be used to create a cipher. Theatrum orbis terrarum Abrahami OrtelI Antuerp. Abraham Ortelius's Theatrum Orbis Terrarum (Theater of the World) is considered the first atlas, a book combining uniform maps and text into a single volume. Published originally in Antwerp in 1570, the Theatrum became an unexpected hit and was reprinted and enlarged in subsequent editions—by 1612, the original 70 maps had been expanded to 167. 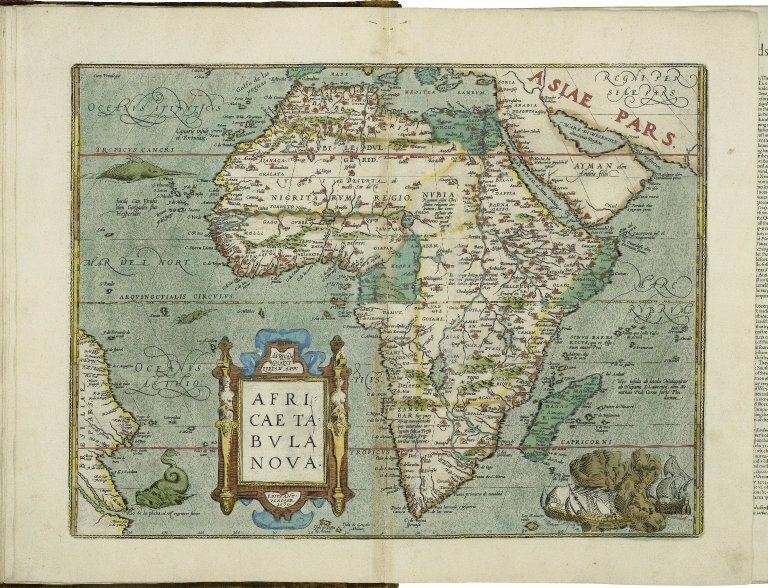 This image shows the African continent in the 1606 edition. Like the rest of the maps in the atlas, this engraved map would have been printed in black ink on white paper, and then hand-colored. The volume has been digitized in full by the Folger and can be viewed in our digital image collection. Many early printed texts were accompanied with woodcut illustrations, images made by cutting a design into a plank of wood. The areas that were to print as black lines were left in relief, and the white spaces were carefully carved out; the whole thing was then set alongside the type and printed on a single press. 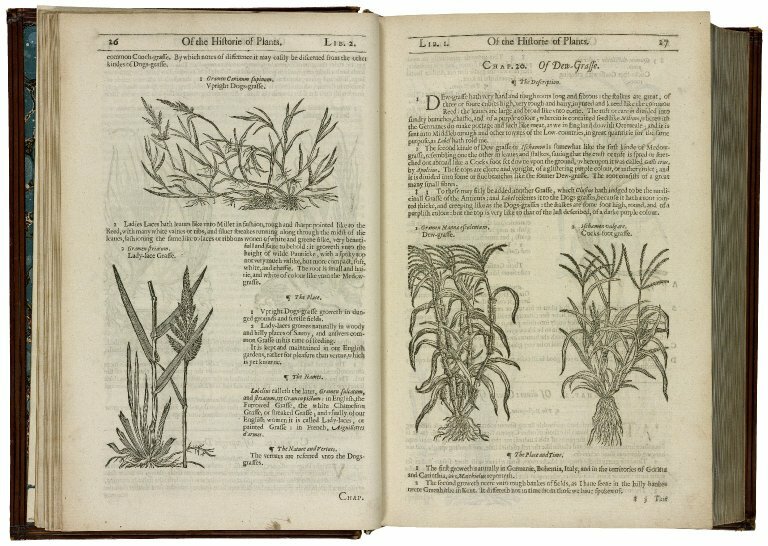 The woodblock shown here is one of the blocks cut in 1562 to illustrate one of the bestsellers of the Renaissance: Pietro Andrea Mattioli's commentary on a text from Ancient Rome, Dioscorides' work on the medicinal properties of plants. 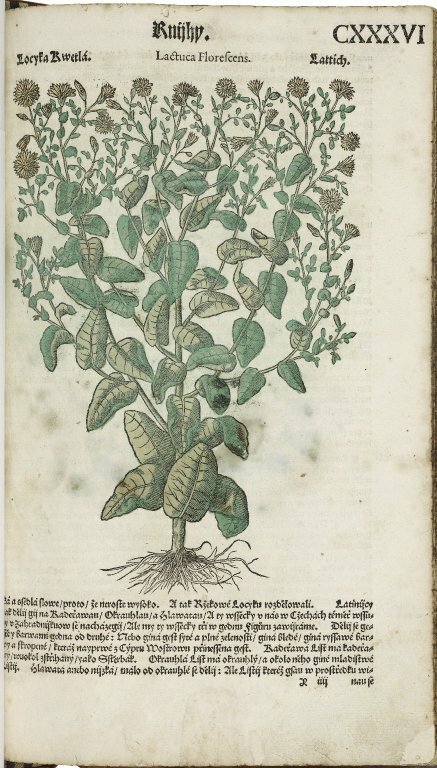 This page from Mattioli's commentary shows the print of "Lactuca florescens" made with the woodblock shown in this image gallery. The book and its illustrations would have been printed in black ink on white paper, this copy of the book was carefully hand colored. 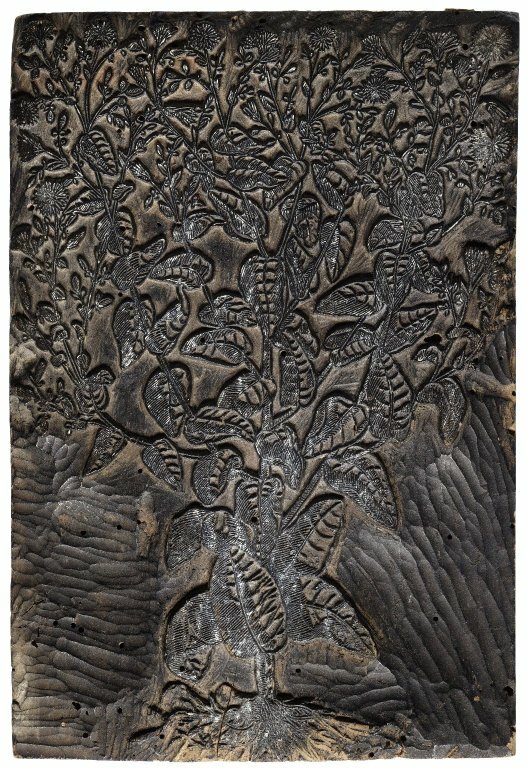 Although you cannot see the edges of the woodblock on the print, you can see how the shape of the plant has been affected by the rectangular shape of the woodblock. The Folger has the world's third largest collection of English books printed between 1475 and 1640, comprising over 18,000 editions, many in multiple copies. It contains another 29,000 English editions printed from 1641–1700, one of the top four such collections in the United States. These collections are supplemented by another 20,000 editions dated 1701–1800. The Shakespeare collection of printed books includes 178 early modern quarto editions of the plays and poems—small, inexpensive books that began to appear during Shakespeare's lifetime. All are extremely rare, and some are the only known survivals. For example, the Folger has the only copy of the first edition of Titus Andronicus (1594). 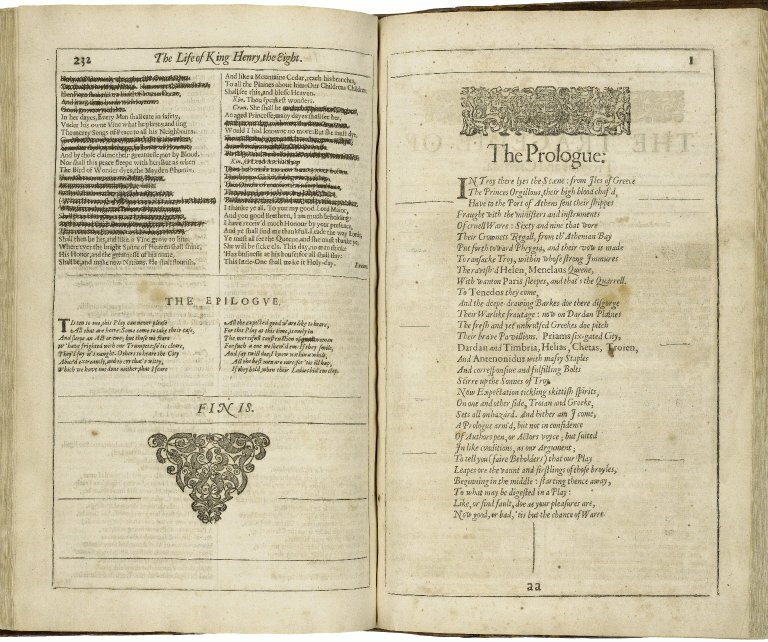 In addition to its 82 copies of the famous 1623 First Folio, the first collected edition of the plays, the Folger collection also holds 58 copies of the Second Folio (1632), 23 copies of the Third Folio (1663–64), and 38 copies of the Fourth Folio (1685). The Shakespeare Collection also has about 7,000 other Shakespeare editions spanning the 18th century through today, including hundreds of foreign editions in more than 70 languages and many modern fine press editions. The Folger houses more than 35,000 early modern printed books from the European continent, on subjects ranging from religious disputes to military tactics to travel advice. About 450 are "incunables," books printed before 1501, in the infancy of printing. Works related to the Reformation include more than 2,000 volumes by Erasmus, Luther, Calvin, and other authors. The collection also has a wealth of Italian drama, travel books, classical authors, emblem books, science and technology, military history, and French and Dutch historical and political pamphlets. It includes significant collections of printed herbals—guides to using herbs and other natural materials—and festival books—richly illustrated depictions of the public Renaissance extravaganzas that celebrated royal visits, marriages, births, and other events. 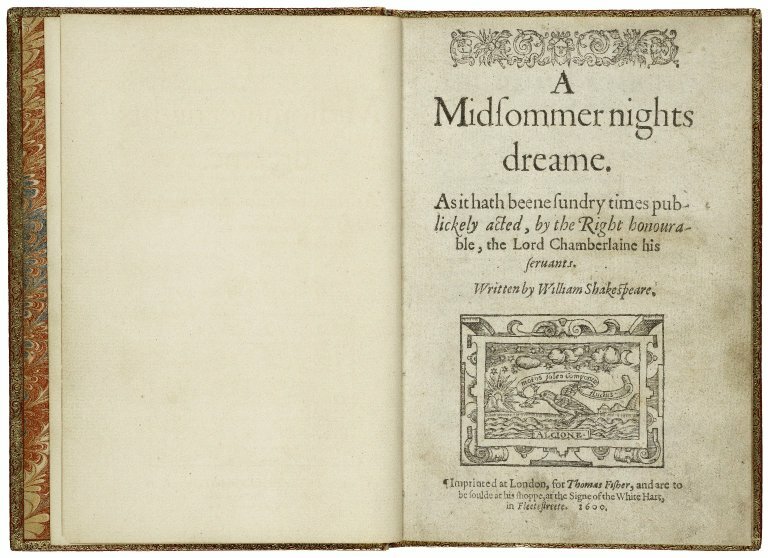 Secondary sources in the Folger collection include journals, reference works, critical and historical books, and current editions of Shakespeare, including the Folger editions and the latest Oxford, Cambridge, and Arden editions. The Folger also holds many facsimiles of early books and subscribes to a number of electronic resources that provide digital editons and fascimiles of early books.